Moderation in the arena of logistical planning is to be applauded. Deciding which handgun to use for self-defense is very similar to logistical decisions in other areas of life. After all, you will have to buy ammunition for your new firearm before it can make loud noises or do anything for you. There is a physical balance between the ‘power’ of your firearm, how much ammunition your gun can hold and the physical size of the weapon. The 40 S&W is one of my favorite handgun cartridges for all of these reasons. 9mm Luger firearms can usually also be chambered for the 40 S&W without any significant increase in the guns dimensions. Since it is a popular cartridge, ammunition for the 40 S&W is almost as cheap as the 9mm Luger but cheaper than the 45 ACP. Lots of males fancy themselves to have big hands. Without violating my strict rule of running a family-friendly wound ballistics website, I will not expound on the reasoning behind this unfortunate misconception and how it negatively influences a persons ability with handguns. The fact remains that you must be able to comfortably grip your handgun in order to shoot it effectively under stress. You have to have large hands in order to shoot double-column 45 ACP and 10mm Automatic handguns, for example. Single stack is no problem … but once you start shooting 45 ACPs that hold 10 rounds or more … fit in the hand will become an issue. This is where the 40 S&W begins to shine. A maximum load 40 S&W is capable of generating 582 ft-lbf of kinetic energy out of a 5.0” barrel while a 9mm Luger is capable of generating 500 ft-lbf of kinetic energy out of the same barrel length. With a 40 S&W, you are showing up with a little bit more gun. The great news is that the grip of the gun is usually no larger than a similar gun chambered for 9mm Luger. Much is said about magazine capacity and it’s of course true that the increased magazine capacity of a semi-automatic handgun is a tactical advantage. A larger magazine capacity means that you will have to reload less—it is not permission to shoot more. The larger diameter of the 40 S&W case means that a firearm of a given size will hold slightly fewer cartridges than a 9mm Luger gun of the same design. Such a gun will still hold quite a few more cartridges than a 45 ACP. For example, a Glock sub-compact pistol will hold (10) 9mm Luger cartridges, (9) 40 S&W cartridges or (6) 45 GAP (slightly shorter 45 ACP case) cartridges. As mentioned above, moderation is to be applauded. Taking a 40 S&W firearm with a 4.0” barrel and a 357 SIG firearm with a 4.0” barrel, the 40 S&W barrel has an internal volume of 0.503 cubic inches while the 357 SIG barrel has an internal volume of 0.396 cubic inches. You are pushing the same propellant charge down a barrel which offers less space for expansion (and thus cooling) of the propellant gas. The warmer the gas, the higher the pressure. 357 SIG accelerates the bullet faster and further down the barrel than the host cartridge, the 40 S&W. Bottlenecking also allows for lighter bullets to be used since there is less concern over the bullet being ‘cocked’ sideways during the loading process. 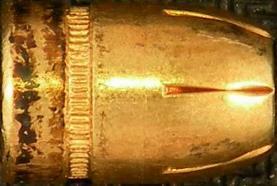 This is why you don’t see conventional bullets much lighter than 165gr in 45 ACP for example. There simply is not enough real estate on the bullet bearing surface to allow for proper bullet seating. If you are able to shoot a 9mm Luger well, in a handgun which comfortably fits your hand, there is no reason not to step up to a 40 S&W and practice with it until you are satisfied with your ability to use it while under stress. “Accuracy, power, speed.” In that order. You will probably opt to carry a compact or a sub-compact 40 S&W. While I am a fan of this caliber, I must caution you that the recoil will be fairly ’sharp’ and will not resemble a ’push’ like you get with lower-pressure cartridges. The recoil is not bad, but if you only shoot a sub-compact occasionally, it will feel almost unmanageable. 40 S&W is useful for another reason—research and development. If I am researching some sort of effect, that is thought to be common to all handguns, 40 S&W is a great point of focus because it is right in the middle, physically, of the handguns. The bore size is basically the average between 0.310” and 0.500” and the kinetic energy out of the muzzle is near the middle between 0 ft-lbf and 44 Magnum. To the left is a test that I ran on 40 S&W ammunition to determine the effect of submergence in water on the velocity of pistol ammunition. The test was done to MIL-STD-810G standards and features 7 popular defensive JHPs (click here for full report). I recommend 165gr or heavier Jacketed Hollowpoints be used for self-defense if you own a 40 S&W handgun. Lighter bullets can potentially penetrate deeply enough to be effective from all shotlines. The tradeoff is that if they do not penetrate deeply, they will do greater damage to the shallow structures. Ultimately this choice is left to the shooter of the ammunition but I recommend that you opt for bullets that penetrate to at least 12.0” depth in 10% ballistic gelatin or 8.0” depth in 20% ballistic gelatin. If you have made the move up to 40 S&W and can qualify with that weapon on a challenging, timed, course of fire like the FBI Special Agent qualification course, then it behooves you to practice until you can complete that course with full-power 40 S&W ammunition. If you get attacked, you need to ‘hit them hard’ and put their lights out before they can kill or grievously wound you. We test a 40 S&W Browning Hi-Power and six different types of ammunition against synthetic bone plate and gelatin.